Our company provides residential and commercial concrete contractor services for stamped (decorative), stained, exposed aggregate and multiple other concrete finishes for driveways, patios & more in Indianapolis, Indiana and surrounding areas. 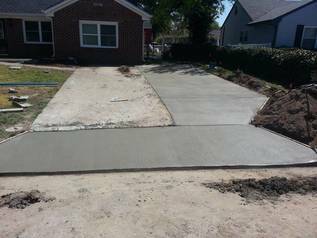 We are a full service concrete contractor that cares and the end result. Most common projects we perform are repairs, resurfacing, replacements and new installation. 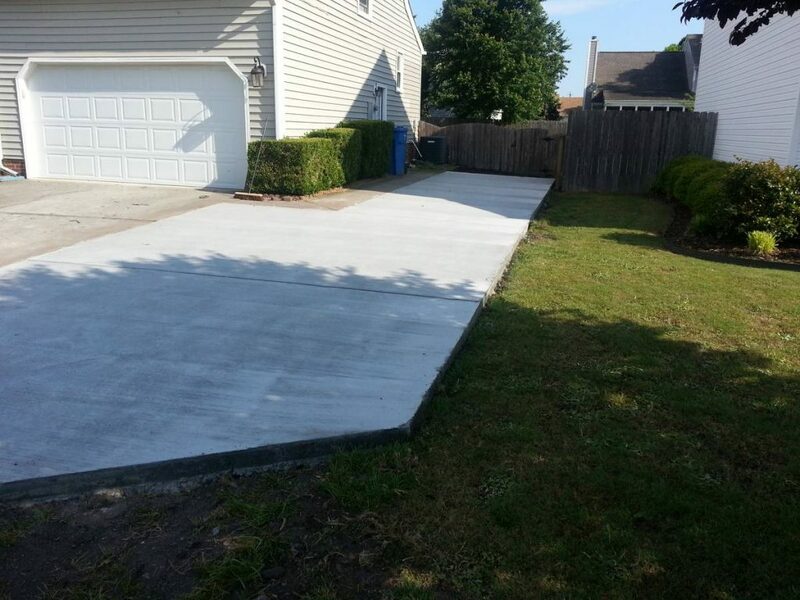 We are proud to offer a wide range of concrete services and free estimates to those who live in Indianapolis, Fishers, Carmel, Noblesville, Greenwood, Anderson, Lawrence, Westfield, Plainfield, Zionville and will go as far as Brownsburg, Franklin, Greenfield, Shelbyville and Avon, Indiana. Give us a call at (317) 961-7041 and request your FREE personalized estimate today! Choosing concrete for your home improvement project is an excellent decision. It provides a truly superb mix of durability and versatility. The durability of concrete goes without saying really! It is one of the toughest materials that you can employ around your home and it can withstand near enough any extremes of temperature and weather for decades with only light maintenance. The versatility is perhaps a little less well known aspect of concrete, and we’ll go into it a bit more below. Suffice it to say however, it provides essentially a blank canvas that is suitable for a wide range of potential designs and finishes. Concrete is also an investment – we appreciate that you are investing time and money in our product, and we aim to repay this investment by striving to always provide outstanding customer services and a truly superior product. One of the most popular uses of concrete in home construction projects. Concrete is tough enough to stand up to adverse weather conditions such as winter snows and baking summer sunshine. It also allows for a range of finishes via concrete stamping, to ensure that whatever design you envisage to complement your house exterior, concrete can provide exactly the blank canvas to express your design ideas. 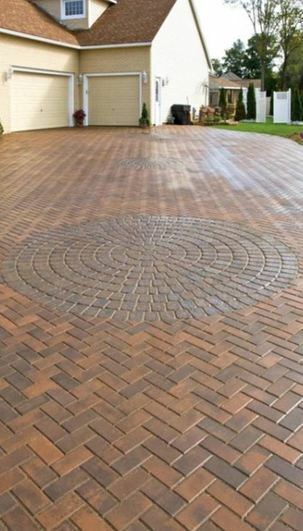 A popular and time-honored choice for your concrete driveway, this method has been around for over 50 years. We can supply this product in a vast range of colors and styles, incorporating both traditional and contemporary designs, meaning we’re certain to have just the type of CBP you’re looking for. The new kid on the block! Unlike CBP, this method consists of a liquid concrete layer poured atop a suitable sub-base. The benefit of this system is that it provides a true blank canvas, with various colors and decorative concrete designs added before the concrete dries. If you are looking for a truly bespoke design experience with your driveway then PIC could be the choice for you. 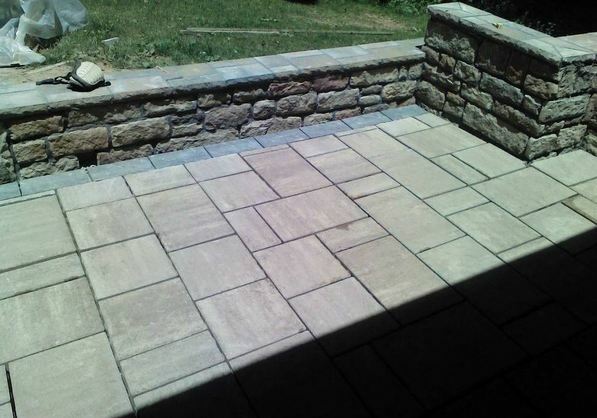 Similar to the driveways mentioned above, a patio is a real investment in your property – so make sure you choose the best material for it! Again, very similar to the driveways, patios have to stand up to a lot of abuse – probably more abuse than you would ever realize. But just think about it. they are out in the weather all year round, taking whatever the elements have to throw at them. When they are in use, they can be put under immense strain, be that from heavy footfall, decking furniture being dragged over them, etc. Concrete is the kind of material that can not only stand up to these abuses, but will continue to look great for years to come with only minimal maintenance. 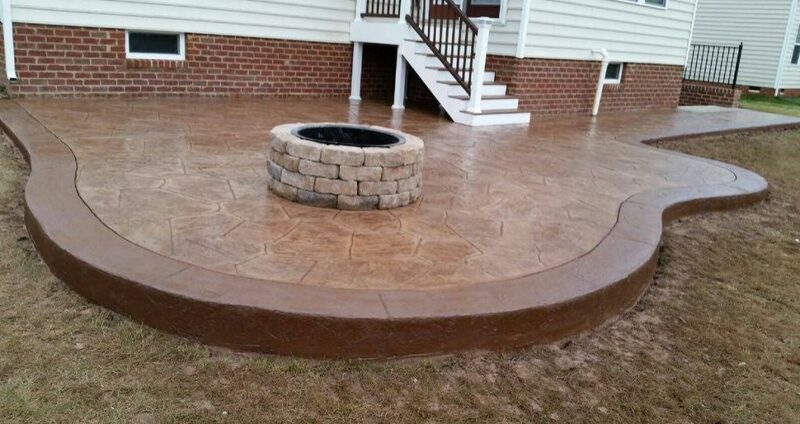 A concrete patio is truly a feature that you can build the design of your back yard around. When compared to, say, wooden decking, a concrete patio provides unparalleled levels of durability. Some people may assume that concrete patios can be dull. Well, we’re here to prove that there is nothing that could be further from the truth! In fact, concrete is such a versatile material to construct with, we can build you a patio completely unique to any other out there. As a poured medium, concrete can conform to any design shapes you have in mind. Further, with today’s vast array of stamps and coloring products, almost any finish can be applied. Concrete really does provide everything you need to really let your imagination run wild! A very much-underrated way to utilize concrete, nonetheless concrete slabs can have a range of uses in both domestic and commercial construction. We provide a comprehensive range of concrete slabs to meet the needs of nay our customers. These range from steel reinforced 20-inch thick slabs for the construction industry down to 2 inch colored slabs in you’re just looking to easily lay a nice path in your backyard. No matter what the purpose and no matter how much you buy, we treat every customer as an individual, and pride ourselves on supplying the very best product. One of the most important items in both industrial and domestic construction is the humble concrete slab. If you are looking for steel reinforced slabs for heavy-duty construction we’ve got you covered. On the other end of the spectrum, if you’re in the market for thinner slabs for laying a path in a domestic construction product we’ve got a wide range in stock. Whether it’s a 20-inch thickness or all the way down to 2 inch, we are proud of each and every one of our products, and are happy to state they are the best quality in Indianapolis. For those concrete installations where you want the finest designed finishes, then stamped concrete may well be the product for you! For example stamped concrete patio uses vinyl stamping mats to add a textured finish, literally stamping it into the concrete before it sets, but the same goes for any other surfaces, like driveways and pool decks. Further, we also add coloring agents to create stained concrete and to ensure it sets with the specific color or tint that you want. The stamps themselves are modeled directly from the material they impersonate – be that stones, tiles, bricks or even wood. This means that stamped concrete provides an incredibly realistic finish – we’ll bet you’ve probably walked over stamped concrete in the past few days, and not even realized what it was! It’s an economical way to achieve the finish of a material like stone or tiles – with a far quicker installation period, and all the usual durability of concrete. Stamping used to be one of the best-kept secrets of the construction industry. 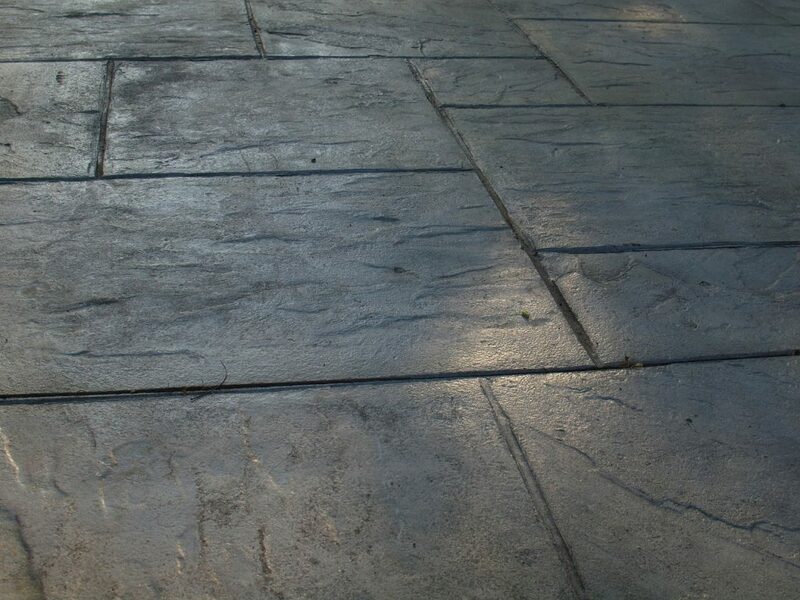 In fact, we’ll wager that you’ve probably walked over stamped concrete today, and not even realized it! 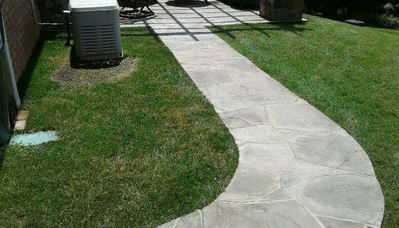 Stamped (or decorative) concrete is an excellent, and economical design choice for laying paths, patios and driveways. 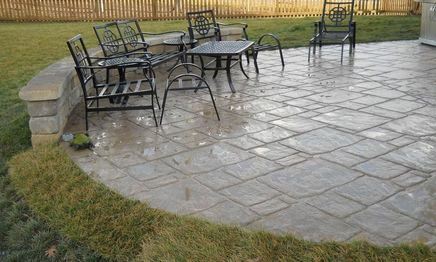 With the advances in stamp technology and coloring techniques it is now possible to install stamped concrete that resembles natural products such as stone paths. We have one of the most extensive libraries of stamping options available in Indianapolis. 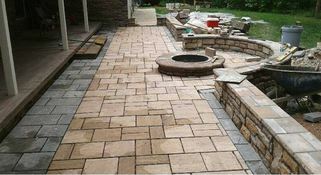 Just contact us for a quote and to see some examples of the stamped concrete we have successfully installed in the past. 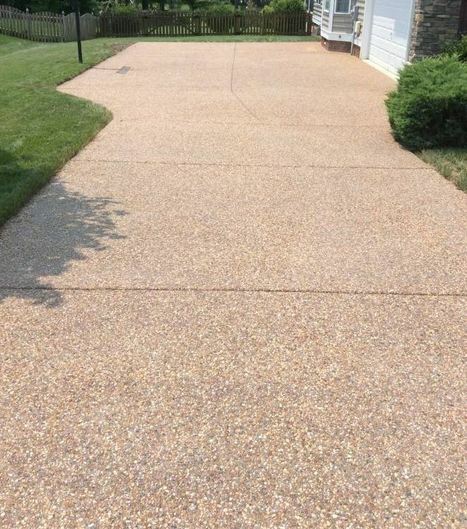 This product is a poured concrete surface, such a driveway, path or floor, where the top layer of the concrete is treated with a chemical agent. This chemical makes the top layer of cement remain soft and paste like, even as the rest of the concrete hardens. This in turn allows us to remove the cement but leave the aggregate behind – the aggregate being the small stones and chunks of crushed rock that are a key ingredient of the concrete mixture. The durability argument for concrete stands up for itself. Our concrete, once laid, will last you for decades. In terms of longevity and low maintenance, concrete blows any other material out of the water! But sometimes, you may want the durability of concrete without the thrills of a stamped and colored finish. At the same time, poured concrete that is simply left to dry can end up looking a little… dull. Exposed aggregate is the perfect middle ground, where we remove the very top level of concrete to leave the “aggregate” (small stones in the concrete mix) exposed. This creates a natural looking pattern, with more interesting looking finish than freshly poured concrete at a cheaper price than stamping and coloring. If you’ve seen concrete where the surface stones are clearly sat atop and slightly above the cement level, then you’ve seen exposed aggregate concrete. This product has applications where you may want a nicer, more interesting finish than plain, poured concrete – but at a lower cost than stamped concrete. Exposed aggregate also naturally provides an excellent anti slip surface, making it ideal for use in pool decking or paths and driveways. If you own a pool, or are considering installing one, then you really need to get in touch with us! Concrete is a superb material to install as a deck around your pool. Unlike wood, concrete will never warp or rot in the presence of moisture, making it an extremely durable material for use in pool decks. Special non-slip coatings and finishes can be added during construction too, making concrete the safest material to have around your pool. Finally, concrete’s sheer versatility means that it can fulfill any design ideas you may have, conforming to any shape and most types of finish you can imagine. A pool is, after all, a fantastic addition to any backyard – use concrete to give it the best possible finish you can and really make your pool stand out! 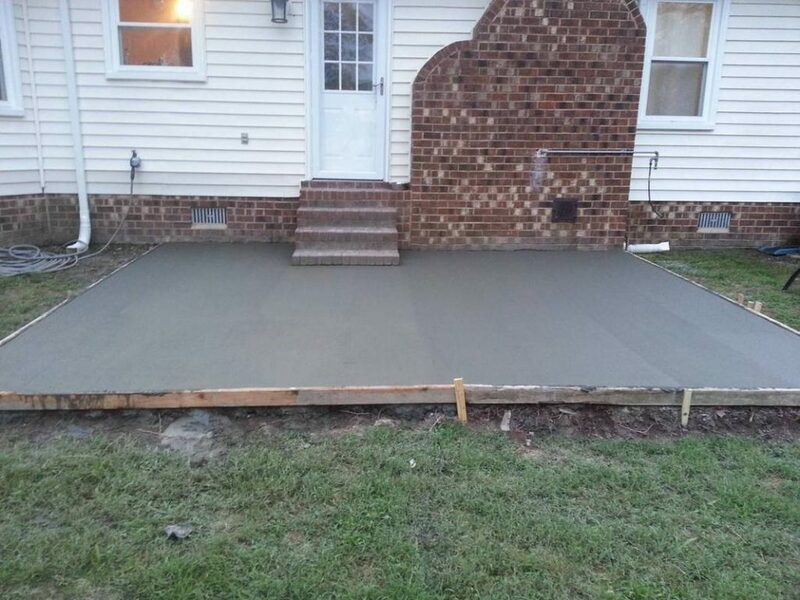 In addition to brand new installations, we also perform repairs of older concrete. If, for example, you’ve moved into a new home and inherited some concrete that has not been well looked after then you may be concerned that pulling it out and replacing it is the only option left to you. That can be an extremely time consuming process – not to mention expensive! Happily it’s often not the case that a full replacement is required. With the advanced range of materials, tools and techniques at our disposal – not to mention years of experience – we are very often able to bring poorly maintained concrete back to its former glory. We also offer a comprehensive range of concrete repairing solutions. Unlike other companies, we do not consider our services a mere sticking plaster type repair. Instead, we will work closely with you to diagnose any underlying problems to provide effective, long term repairs and solutions. From errors with new builds to the effects of long-term deterioration, you can trust us when we say that we’ve seen, and repaired it all over the years. We will also strive to investigate and diagnose any underlying issues that ay be affecting your concrete – when we repair, we do it to last! Another excellent way to repair damaged concrete is to resurface it. Because concrete is such a durable material, it can often be the case that whilst the surface may be tired and worn after years of service and poor maintenance, the concrete beneath the surface still has years of service to provide. In cases such as this, we provide a full resurfacing service. We use special concrete that contains bonding agents to bind the new concrete to the previous level – it’s not possible to simply pour normal concrete onto an old base! If full on repairs are not required, we also offer comprehensive concrete resurfacing services. If your driveway, garage floor or patio is simply beginning to show it’s age, then resurfacing can be a cost effective way to return your floor to it’s youthful best. If you are in the market for one or more of these services, then please don’t hesitate to get in touch for a quotation. Even if you just have a query at this stage, one of our friendly staff will be more than happy to assist you. We always strive to give the very best level of service – from the first time you speak to us to the moment that the very last drop of concrete is poured or the final slab placed into the ground. We leave no stone unturned in our desire to provide you with the best level of service. We realize that quality is important to you. But at the same time we recognize that these are difficult financial times for everyone. The duel challenges of affordability and quality can be difficult to match but we strive to achieve it with every job we take on. We are proud of the fact that our employees are highly trained professionals, and our vehicles and equipment are top of the range. We employ the most modern techniques and technologies alongside time honored processes and experience to bring you a top quality finish for the very best value. For us, no job is too big or too small – your construction project is important to you because is yours. We recognize that, and we will always strive to give the very best level of service to everyone in Indianapolis, irrespective of the size of the job. 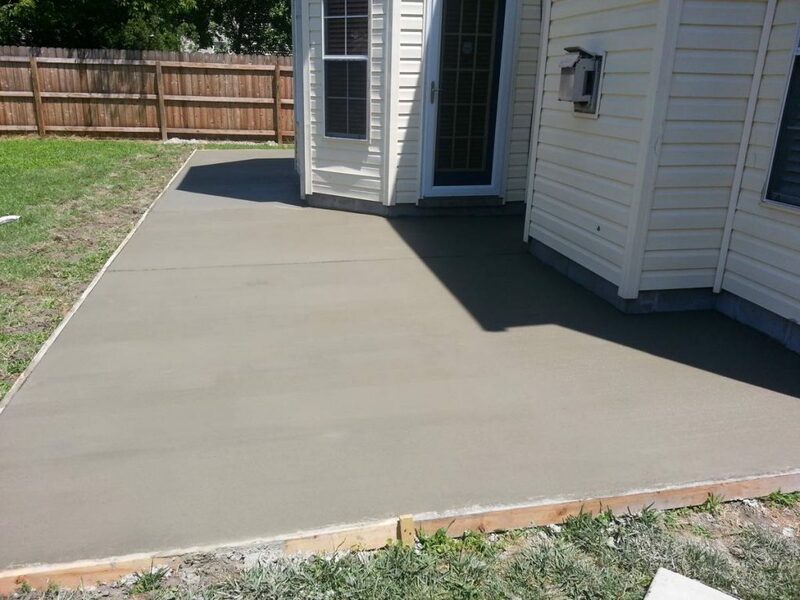 If you are looking for the very best concrete contractors in Indianapolis, then you don’t have to look any further. If we are too busy when you call, there are many other cement companies like Mattingly Concrete, Indianapolis Concrete, Indy Decorative Concrete, Rods Quality Concrete and multiple others that can help you. If that is the case, we apologize for any inconvenience. If you are interested in one of our services – whether this is to book a quotation or simply to look for further advice, please don’t hesitate to get in touch with one of our friendly staff, who are standing by to assist you!